Marlowe plc is a UK leader in specialist services which assure the safety and regulatory compliance of commercial properties, whilst managing risk for businesses across the country. The company was formed to create sustainable shareholder value through the acquisition and development of businesses that provide regulated inspection, testing and compliance services. It is focused on health & safety, fire safety, security, water safety, water treatment, air quality and environmental services – all of which are vital to the wellbeing of its customers operations and are invariably governed by regulation. Marlowe currently provides services to over 10% of Britain’s commercial properties and is increasingly attractive to customers who require a single outsourced, nationwide, provider of a comprehensive range of regulated safety services. Its customers can be found in most office complexes, high streets & leisure facilities, manufacturing plants and industrial estates, and include SMEs, local authorities, facilities management providers, multi-site NHS trusts and FTSE 100 companies. Marlowe plc’s decentralised operating model gives our businesses considerable autonomy within a well-defined strategic and control framework. Its managers are empowered to make the decisions that they need to for their businesses and markets. The model seeks to retain the agility of entrepreneurial private businesses whilst providing a platform, as part of Marlowe, which unlocks their potential and stewards their rapid growth, ensuring that all the key stakeholders are focused on value creation. 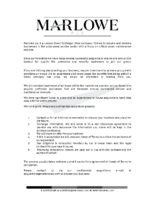 Marlowe plc is always looking for quality fire and security companies to join its growing Division. 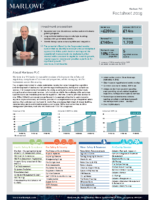 Download the Marlowe plc Acquisition Guide and Fact Sheet.